Background:Earlier this year we were asked to help an executive change his name. While people naming is not really our business, it does fall into our territory when your name becomes a key part of your personal marketing and business image. And as our regular readers know, we are big fans of names that cut through the marketing noise – whatever your business or industry.And, of course, when it comes to people names, most are not trademarked (or even trademarkeable) and duplicates are certainly allowed. How many Toms, Mikes, Susans do you know? In the USA, this is seldom a problem, as there are so many different last names. But what about Denmark where half the population has a last name Anderson or Andersen? Or more interestingly, for this week, what about Korea where so many people have the last name Kim? Well then your mother gives you a unique first name like Ju-Yun. 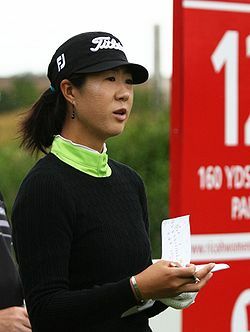 Which is all well and good until you turn out to be a golf star and play in the LPGA championships and there are 6 other Kim’s in the field and the US announcers can hardly keep them straight. That is when you see the marketing potential and power of the name Birdie! How more appropriate can a name be for a lady golfer? How much fun can you have with that? And how your agent will love you – now that all your marketing cuts through the noise. Winning the US Open helps a lot too of course, but this way she will never go down in the history books as simply that Korean youngster with the big smile. See her full stats and bio on the LPGA website. The neutral presentation rating here is simply a place holder until we see what Birdie’s new logo and image looks like. In the meantime, we know Birdie is shooting for birdies on every hole.